Want information on license plate collecting? 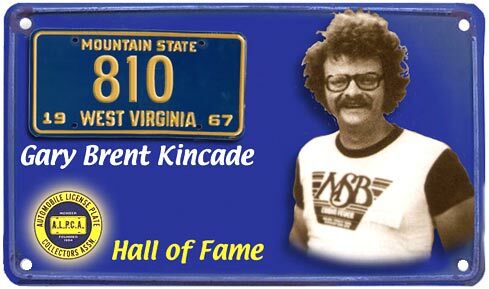 Write Gary Brent Kincade, Beckley, West Virginia. Those words, found in virtually every automotive collecting magazine published in the world, are among the most familiar in the history of ALPCA. That simple little advertisement helped the club grow nearly 400% during Gary's tenure as Secretary. Gary served as Secretary from 1977 to 2000. Gary and his wife Willie were considered the unofficial first family of ALPCA. Upon arriving at a National convention the first people greeting you were Gary and Willie. They would dispense your credentials, sell you a T-shirt, hat or other souvenir and be there to address your concerns. They would run the front desk throughout the convention leaving precious little time for them to socialize, trade plates or renew acquaintances. That was the mark of dedication they both brought to the club. It didn't stop at National conventions. If you attended the antique car shows in Hershey you would seek out the big ALPCA tent and there was Gary offering a helping hand and a place to rest. He would sell you ALPCA souvenirs and handle any other club business that required attention turning the car show into a mini-convention. Gary was born in Pasadena, California in 1942. He grew up in Scarsdale, New York and received a Bachelors Degree in English Literature from Bucknell University in Pennsylvania. He married Willdene (Willie) Carol Pierre in Florida in 1971. Gary worked for the U.S. Army Corps of Engineers, which took him to West Virginia. Gary would move on to the U.S. Postal Service where he remains today. Discovered ALPCA in 1967 and has one of the best license plate collections ever assembled. Other interests include old painted label soda pop bottles, and a modest antique car collection. While not native, the Kincades have called West Virginia home for more than thirty years. For countless years of service Gary Brent Kincade is inducted into the ALPCA Hall of Fame.